Most Thailand diving holidays originate in Phuket, and for good reason. The country’s largest island, Phuket covers 209 square miles (336 km2) and is home to half a million people. Most of the island’s dive operations are along its southeast coast, right on the shores of the Andaman Sea. Expeditions regularly leave Phuket for dives around neighboring islands, and further afield, most particularly around the very popular Phi Phi Islands in neighboring Krabi province, some 2 hours east of Phuket, and the world’s top diving destinations – Similan Islands. Diving in Similan Islands Thailand is no doubt the unforgettable and exciting holiday you may have. The clouds were burnished bronze by the setting sun as we departed Phuket’s Chalong Harbor for the northern Andaman Sea. 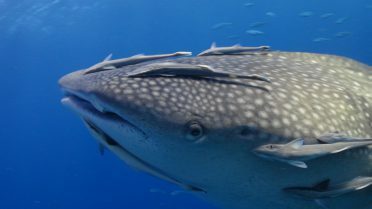 Destination – diving in Similan Islands. With several hours to cross to the Similan Islands, we had ample time to assemble camera gear and unwind with a glass of wine. There would be no diving that night. Located about 60 miles (97 km) North of Phuket Island, the Similans comprise nine granite islands washed by blue water and rimmed with gorgeous white-sand beaches. Similan Islands National Park was established in 1982 to preserve this national treasure, and strict rules are in place to protect the islands’ ecosystem. Diving boats are required to use established moorings or to conduct diving from a lifeboat or dinghy. They must also operate with closed waste systems to minimize pollution. Diving in Similan Islands is one of the world’s top diving destination and divers must respect the rules to preserve and protect Similan Islands. Anita’s Reef proved to be a good starting point for your Similans diving holidays. Cascades of plate corals plunge into the depths there, patrolled by small schools of yellow snapper. One particular coral tower earned the name “One Roll Rock” in the era of film photography, but it typically yields far more than 36 good shots per dive to today’s digital enthusiasts. East of Eden brings both large and small things into focus. Shrimps and crabs cling to crinoids and lurk beneath sea cucumbers. A wide-angle perspective and artful application of strobe light accentuate the pinks, oranges, purples and reds of the fans against the dark blue background. Diving in Similan Islands is also diving at Koh Bon Island. The Island was a two-hour steam away, but ghosts of manta encounters past fueled our anticipation. The cleaning stations on the southwestern tip of Koh Bon bring in mantas quite often, but the visibility the day we visited was not conducive to manta sightings. It was the shoulder season, and the monsoons already had occasional impacts. A month ago there had been 100-foot (30m) visibility and slick calm seas there, but such is Mother Ocean. Jumping in, we descended down a steep wall to 120 feet (37m), accompanied by a pack of trevally jacks along the way. Yellow soft corals on the under side of boulders brought color and life to the massive stones, while a solitary manta in the far distance reminded us that the graceful elasmobranchs were so close and yet so far. Diving in Similan Islands can not be completed without visiting another famous dive site. Tachai Pinnacle was especially memorable. Although we divers normally wish for maximum water clarity, on this dive an amazing phenomenon transpired: A nutrient rich upwelling totally and suddenly permeated the reef. The ocean was warm, about 84°F (28°C), and from out of the blue (literally) came frenzied schools of trevally and fusiliers. Hazy water flowed in and turned from blue to brown as the temperature dropped a dozen degrees in as many minutes. The fish were frenetic, eating the tiny particles in the oncoming flow. Within a few minutes the rush was over, and the visibility returned. A few small blacktip reef sharks passed by, excited by the racing food chain, and a resident school of a dozen batfish posed willingly for portraits. We spent the entire next day at Richelieu Rock. This site – one of the top 10 dive sites in the world, according to the diver community – consistently delivers at the highest level of expectations. The rock is actually a large pinnacle about 150 feet long (46m), barely breaking the surface at low tide. The site is small enough to be known intimately by the divemasters, and they eagerly pointed out a yellow seahorse, about 5 inches (13cm) long and in a dramatic, vibrant habitat. Just to its left a distant relative resided: an ornate ghost pipefish camouflaged amid soft corals. The boulders here were carpeted with anemone and clown fish, decorated with soft corals and patrolled by lionfish. As we moved up the rock, the water was thick with glassfish. Thousands of these shiny, 2-inch (5cm) fish undulated in waves along the rock face. A school of opportunistic and hopeful jacks circled the perimeter of the glassfish mass. And if all that wasn’t enough to overload our senses, we came upon a pair of Whale sharks swimming around divers. We stayed the whole day and night, and no one tired of the photo opportunities that Richelieu – or, for that matter, the rest of the Similan Islands – offered. Diving in Similan Islands was certainly one of the most exciting dives that every diver may expect. Dive sites are very rich and the bio-diversity is just exceptional. Doesn’t matter the scuba divers level, diving in Similan Islands is one of the “must to dive” place, but is always better to have few dives under the belt and be advanced to profit of all the dive opportunities that Similan Islands offer. In Phuket, the PADI Advanced course, takes only 2 days and the cost is very low.